This post was written in December, 2016. There is a story behind this horse. 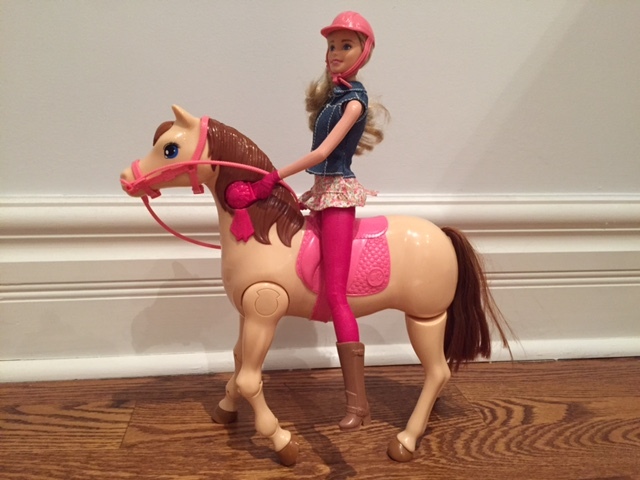 This horse and her Barbie friend were given to Skye by a woman I admire deeply and hold in the highest regard for the level of care she gave my Gavin whilst he was in residence on the bone marrow transplant unit, 8B, at the Hospital for Sick Children. She is a doctor who fights for her patients with ferocity and adores them with a mother’s heart. It’s been almost six years since we left that unit, but I will never forget how she, and the other doctors there – and nurses of course – fought and prayed and believed in the Bean. To backtrack a little bit, as it’s been ages since I updated here, this past fall I met with Cancer Genetics at the hospital to discuss our unique situation. How do we screen a child who may develop a brain tumour but hasn’t as yet? Who is responsible for the care of such a child? How often should such a child be screened and in what way? These are all questions that the doctors at Sick Kids have been having a big think about, and have come up with a few answers. And they are: A little girl like Skye who carries a mutation in her SMARCB1 gene should be surveilled. She should have MRIs every 6 months of her brain and spine and probably whole body, just to be sure. She should have abdominal ultrasounds every 4 months, just to be sure there’s nothing going on in her kidneys. And her mother (yes, ME) should have these things too. But at Toronto General, not Sick Kids, because obviously, I am no longer a child, but a rational, able adult. On most days. After a couple of months of mulling all of this over, I received my instructions. Skye was to be seen at Cancer Genetics Solid Tumour Clinic, with an appointment for abdominal ultrasound. And an appointment was made for an MRI in January. I was to be seen at the Neurofibromatosis Clinic at Toronto General – because they are the ones who best understand genetic changes and tumours. So dutifully, I went and met with my team, and discussed, and now await an MRI appointment, which may take several months. And I went and met Skye’s team, and discussed things some more. The day of my wee one’s appointment was kinda cursed. We had a clinic appointment at 11:00, and ultrasound at 1:00. Toddler timing couldn’t have been worse, because, as you may know, 2 year olds eat lunch at 11:30 and go to sleep by 1:00. I tried to shift the timing, to no avail. I knew that ultrasound wouldn’t be pleasant, so I enrolled the aid of the trusty Bubby to come help me hold my daughter down while her abdomen was probed. On the day, on the 8th floor, as we exited the yellow alligators, Skye and I encountered the lovely doctor mentioned above. She was thrilled to hear about how well Gavin is doing. Upon hearing that Skye wasn’t happy to be there that day, she marched us up to her office to find her a gift. And she pulled open a closet stacked high with toys. Toys that she keeps to give her kids when they are down, when things aren’t going well, when they are going well, when they need a break, a change, or just a moment of happiness in an overall horrendous period of their lives. From this horn-of-plenty we chose this marvellous horse and her Barbie companion. The clinic appointment was fine. Skye’s new doctor seems a kind and interesting man. My babe was more interested in opening her new Barbie than anything else. And (for once!) our clinic appointment didn’t take long, so we had time to kill in which Skye kept asking for her yunch over and over. Which had to be denied her as she needed to keep her stomach empty for ultrasound. At long last, Bubby, Skye and I made it to the diagnostic imaging unit. Within 5 seconds of being laid down on the table, my daughter lost it, as I reckoned she would. There was screaming, writhing, and tears. Her voice became hoarse from demanding that the ultrasound be stopped. But I knew that if we stopped, we would only have to come back, so had little choice but to pin her down, and try to calm her and keep her still, until it was finally done. In those moments, I’m split: into two personalities. On one side: the mother who is protecting her baby, and who wants to grab her and run from the room, hurtling gurneys as I go. And on the other: the woman who must allow this to be, who must be calm and rational, and make small talk with the tech. And nod. And smile. And act like everything is okay, when what is happening is so, so far from okay. After that half-hour of grinning and bearing it, it was over, and the images looked alright, and we could go. So we went to find lunch, mac n cheese and sushi, whatever my little one wanted. She fell asleep in the car before I even got out of the parking lot, and I so wanted to pull over and go to sleep too, because it’s all so exhausting at times. I never received a report from the ultrasound, which I’m tentatively taking as good news.